The thymus gland naturally shrinks with age starting early from the beginning of puberty. Right from birth, it’s key to keeping our immune system working efficiently. By helping the thymus gland function at more youthful levels, we can bolster our immune system; fight the effects of allergies, arthritis and many other conditions. It’s known that thymus supplements benefits conditions as serious as Cancer and AIDS. In these cases it’s common to see a supplement that stimulates thymus gland function prescribed -such is the importance of the thymus in bolstering our endocrine system. Thym-Uvocal® is a very effective supplement which contains more than 13 known thymic peptides; far more than any other supplement on the market today. Located in front of the heart and just behind the sternum, the thymus is a specialized gland in the body. Its prime function is to produce T – cells (also known as T -lymphocytes) which are essential for attacking foreign substances in our body. Not only does the thymus produce these powerful immunological cells, but the function of thymus is to ‘educate’ these cells – letting the body know which foreign cells to attack. The thymus is most active during the very earliest stages of our lives -during childhood and before adolescence. By early teens the thymus begins to atrophy and be eventually replaced by fatty tissue. Our bodies do of course maintain our T – cells, but they’re utilized in other parts of our body -the lymph nodes. This is where a Thym-Uvocal® supplement really comes to the fore -greatly helping the function of thymus activity and reinvigorating the production of valuable T -cells. T – cells get their name from being produced in the thymus gland. Even though the production is massively diminished after puberty, they exist in our lymph nodes. Throughout the body, lymph nodes act as filters for foreign substances and particles. They contain B – cells (bursa derived cells), T – cells and other immune cells like NK cells (natural killer cells) which all help our bodies fight infection and disease. The lymph nodes store T – cells but they originate in our thymus which becomes less active as we age. By taking Thym-Uvocal® we can support our aging producers of the valuable T – cells. Not only do they fight new foreign infections, but they ‘remember’ diseases, therefore enabling a rapid and effective response from other white blood cells. As part of the endocrine system -the system for regulating hormones in our body, the spleen and the adrenal glands are all affected by thymus gland function. As well as providing a general sense of wellbeing, clinical trials have revealed that thymus supplements have proved effective for rheumatoid arthritis, reducing painful joints and the intensity of pain by reducing inflammation. As an allergy treatment, Thymus extracts are known to reduce IgE – Immunoglobulin E (IgE) – a class of antibody that is linked to hypersensitivity. Thymus extracts are also used in treating AIDS and certain types of cancer such is its potency in improving the immune system. Other thymus supplements simply contain ground up thymus glands, whereas Thym-Uvocal® is pharmaceutically controlled and contains all the necessary active peptides found in a functioning thymus gland. Rather than focusing on thymic peptide A, a singular synthetic thyroid, Thym-Uvocal® has a complete range, and is therefore generally more effective. One or two Thym-Uvocal® capsules (240mg) taken three times a day will see the immune system thoroughly strengthened, so conditions can be tackled and general wellbeing greatly improved. I was considering taking Thym-Uvocal® since I have always had allergies and I would like to improve my immune response. Do you feel that Thym-Uvocal is superior to Thymic Protein A? 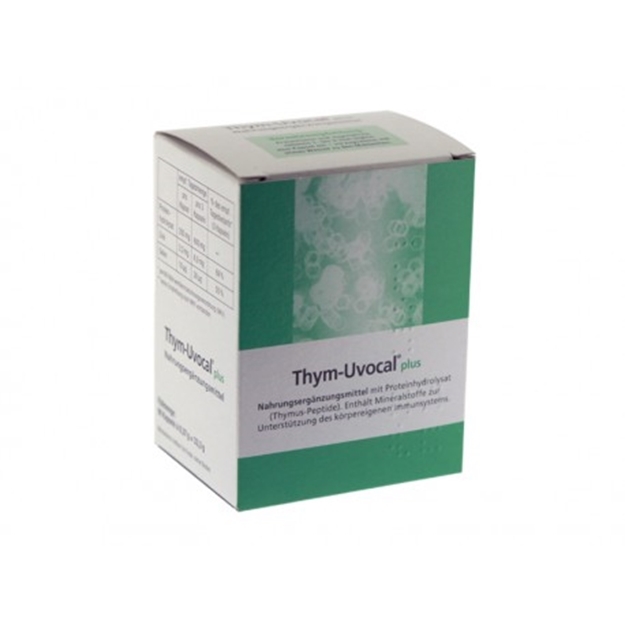 Thym-Uvocal® is a complete thymus supplement of pharmaceutical quality manufactured in Germany. The thymus gland is known to produce at least 13 different thymic peptides, of which thymic-protein A is one. Therefore as it has become better known that thyroid when taken ‘whole’ has superior efficacy to singular synthetic thyroid, it is now believed that thymus when taken ‘whole’ (i.e. as contained in Thym-Uvocal®) is also more beneficial in the long term. Take one or two 240mg capsules of Thym-Uvocal three times a day to augment the body’s thymus output. This is a specially prepared and pharmaceutically extracted thymus, and far more potent than a simple “desiccated and ground thymus” found in a health food store. Using 240mg to 480mg of the Australian bovine extracted Thym-UvocalÃ¢ three times a day improves the thymus condition, helping to correct and slow various aging disorders. The thymus is an endocrine gland that secretes T cells -our body’s natural defence -into the bloodstream. As we age, the thymus, shrinks to nothing, and our T cells take up home in various lymph nodes around the body. Thymus capsules, available as Thym-Uvocal Thymus supplements, provide the body with valuable thymus extracts that boost our immune system, particularly in later life when the thymus has withered completely. Thym-Uvocal Thymus uses 13 different active ingredients from the thyroid gland to help protect ageing bodies from bacterial infection and disease. This makes them the most effective thymus pills available today. Please note that Thymus capsules contain thymus extracts to help the immune system and should not be used to treat thymus disease or any symptoms of thymus problems. Protein free dry substance of calf thymus (Australian origin), Phenol (preservative), Sodium Chloride. Specific stimulation of the immune system, e.g. in primary immune deficiency, inflammatory rheumatic diseases, adjuvant treatment of tumors and precancerous conditions, treatment of lesions induced by radiation and of side effects caused by immunosuppressive drugs, geriatric indications. Hyperfunction of the thymus, e.g. myasthenia gravis, thymus tumors and hypofunction of the thyroid. Although the occurrence of birth defects in relation to this therapy has never been reported, the preparation should not be given during pregnancy or to nursing mothers. Apart from these restrictions, the preparation should not be given to patients with a known hypersensitivity to medical preparations obtained from bovine organs, nether to patients with a strong tendency to allergic reactions. If during the course of treatment signs and symptoms of an allergic reaction do occur, the treatment is to be discontinued. In rare cases, in patients with an atopic disposition (increased hypersensitivity), allergy related skin reactions, such as itching, reddening of the skin, urticaria (nettlerash) and oedema or reactions such as a light fever and shivering may occur. No interactions with other medical preparations have been reported. Maximum dose- 2 tablets (240mg) 3 times daily or 1 or 2 ampoules daily. Therapeutic cycles of 4 to 8 weeks, if necessary several times a year. Thym-Uvocal ® strengthens the defense system and activates the self cure of the body. Diseases that are caused by a damaged or weak immune system can be avoided. Our body’s own defense system, also known as an immune system is able to detect and fight bacteria, viruses and environmental toxins that are intruding into the body. I.E. Disease and infections can be prevented.